Advanced Landscaping & Sprinklers, Inc: Choose Advanced Landscaping & Sprinklers, Inc. This Spring! 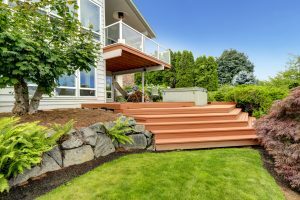 Summer will be here before we know it, and if you’re like most Fort Collins residents, then you’re probably beginning to think about yard maintenance for your home. At Advanced Landscaping & Sprinklers, Inc., we know that you probably don’t want to devote an entire Saturday or Sunday to lawn maintenance, so let us help you out with our landscaping services! We’re proud to be Fort Collins’ Top Rated Local® landscaping company, and we’re also an accredited member of the Better Business Bureau. Get in touch with us today for a free quote! Even though we probably have one or two snow storms left in May, it’s time to begin thinking about your home’s sprinkler system. You probably winterized your sprinkler system with a sprinkler blowout, but you’ll need to have a working sprinkler system if you want a luscious green lawn this summer. You’ll need to wait for the ground to thoroughly thaw before you turn on your sprinkler system, even though we’ve had some beautiful, sunny days recently. The ground is slow to thaw, so use a small shovel to check the consistency of the soil at least 12” below the surface. Your sprinkler system may have become damaged by this year’s harsh winter conditions, so give our landscaping experts a call if you need sprinkler repairs this year. If you’re looking for a way to increase your home’s value and curb appeal, then our landscaping services are exactly what you need! Your home’s landscaping makes a statement, so make sure that it reflects who you are. The team at Advanced Landscaping & Sprinklers, Inc. can help with landscape renovation and patio design, providing you with the perfect space for a summer barbeque or family get-together. We’ll work with you to find a landscape design that meets your needs and your budget, and we offer free, no-obligation quotes for anyone who’s interested in our landscape installation services. Another way to improve your home’s aesthetic appeal is by installing a water feature like a pond or waterscape. Americans are busier than ever before, and installing a waterscape in your backyard can provide you with the perfect place to relax and unwind on the weekends or in the evenings. Whether you sit outside and read your favorite book after work or you sip a cup of coffee in the mornings, we’re confident that you’ll love having a waterscape. If you’ve already got a tranquil garden or some other kind of peaceful area in your backyard, then adding a waterscape to your front yard is the perfect way to make your home stand out in the neighborhood. Your neighbors and anyone who walks by will all be impressed by your beautiful yard, and you’ll have gorgeous scenery to look at whenever you come home or gaze out the front windows. Advanced Landscaping & Sprinklers, Inc. is Fort Collins’ go-to resource for landscaping services. Whether you need sprinkler repairs, lawn care services, or landscape installation, we’re here to help you make the most of your home. Get in touch with us by email or by using our online contact form to request a free estimate! We look forward to working with you.